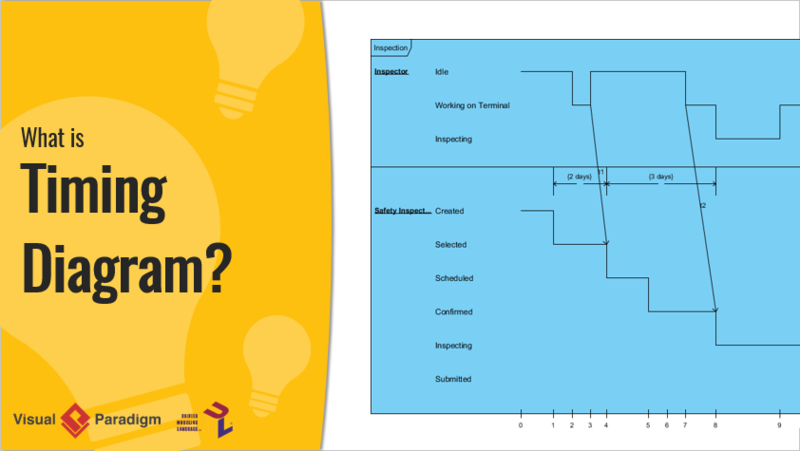 Current: What is Timing Diagram? 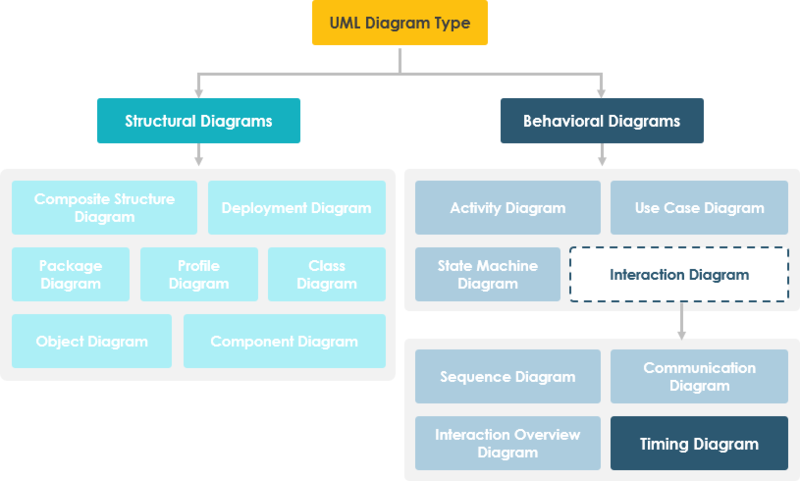 What is Timing Diagram in UML? 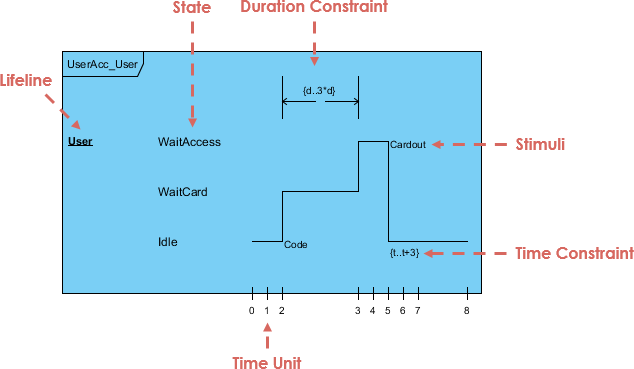 Timing diagrams are UML interaction diagrams used to show interactions when a primary purpose of the diagram is to reason about time. Timing diagrams focus on conditions changing within and among lifelines along a linear time axis. Timing Diagrams describe behavior of both individual classifiers and interactions of classifiers, focusing attention on time of occurrence of events causing changes in the modeled conditions of the Lifelines. Changes from one state to another are represented by a change in the level of the lifeline. For the period of time when the object is a given state, the timeline runs parallel to that state. A change in state appears as a vertical change from one level to another. 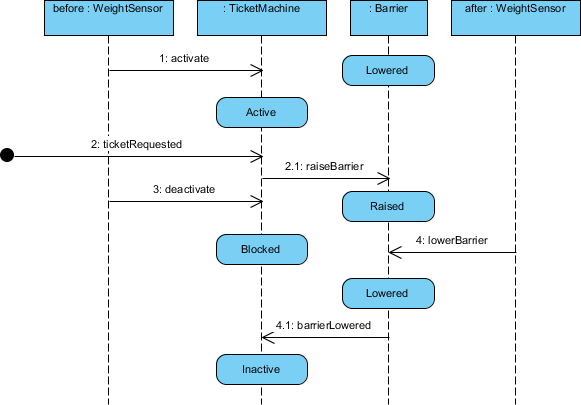 The cause of the change, as is the case in a state or sequence diagram, is the receipt of a message, an event that causes a change, a condition within the system, or even just the passage of time. 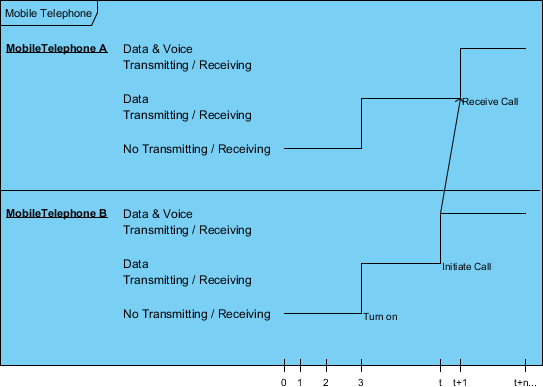 The figure below shows an alternative notation of UML Timing diagram. It shows the state of the object between two horizontal lines that cross with each other each time the state changes. 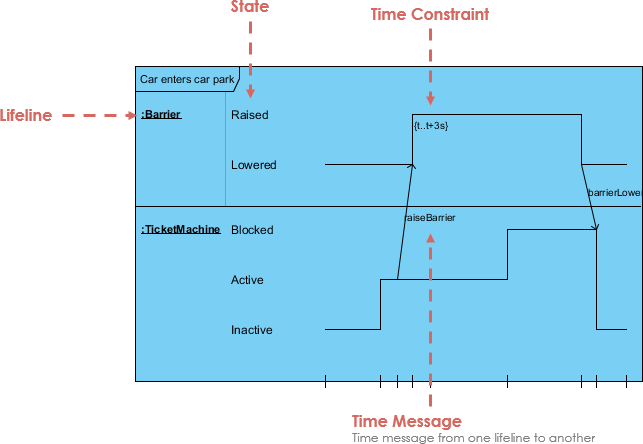 Major elements of timing UML diagram - lifeline, timeline, state or condition, message, duration constraint, timing ruler. A lifeline in a Timing diagram forms a rectangular space within the content area of a frame. Lifeline is a named element which represents an individual participant in the interaction. It is typically aligned horizontally to read from left to right. Multiple lifelines may be stacked within the same frame to model the interaction between them. 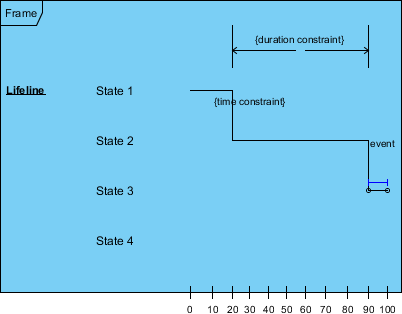 A state or condition timeline represents the set of valid states and time. The states are stacked on the left margin of the lifeline from top to bottom. The cause of the change, as is the case in a state or sequence diagram, is the receipt of a message, an event that causes a change, a condition within the system, or even just the passage of time. It is possible to stack several life lines of different objects in the same timing diagram. One life line above the other. Messages sent from one object to another can be depicted using simple arrows. The start and the end points of each arrow indicate when each message was sent and when it was received. A value lifeline shows the change of value of an item over time. The X-axis displays elapsed time in whatever units are chosen, the same as for the state lifeline. The value is shown between the pair of horizontal lines which crosses over at each change in value. We can use the length of a timeline to indicate how long the object remains in a particular state by reading it from left to right. To associate time measurements, you show tick marks online the bottom part of the frame. You can use relative time marks in constraints to indicate that a message must be received within a specified amount of time. State and Value Lifelines can be put one after the other in any combination. Messages can be passed from one lifeline to another. Each state or value transition can have a defined event, a time constraint which indicates when an event must occur, and a duration constraint which indicates how long a state or value must be in effect for. Timing diagram should always be consistent with the relevant sequence diagram and state machine. To do this we can attach states in the lifeline for each of the objects in the sequence diagram. We can then derive the corresponding timing diagram much easier by inspecting the message passing between the objects against the states attached in the lifeline. The Carpark example below shows the model consistency between two interaction diagrams. 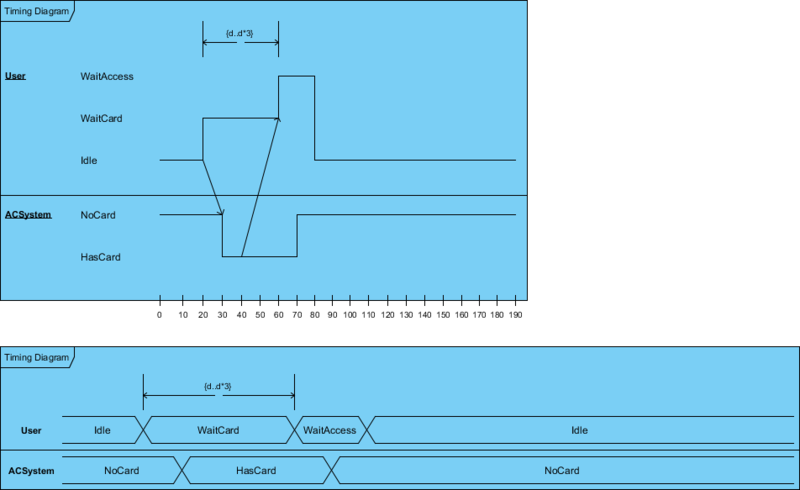 The figure above shows a sequence diagarm of the car park example, while the figure below presents the corresponding timing diagram of the car park example. The various parts of the timing diagram refer to the content of sequence diagram. You've learned what a Timing Diagram is and how to draw a Timing Diagram. It's time to draw a Timing Diagram of your own. Get Visual Paradigm Community Edition, a free UML software, and create your own Timing Diagram with the free Timing Diagram tool. It's easy-to-use and intuitive.